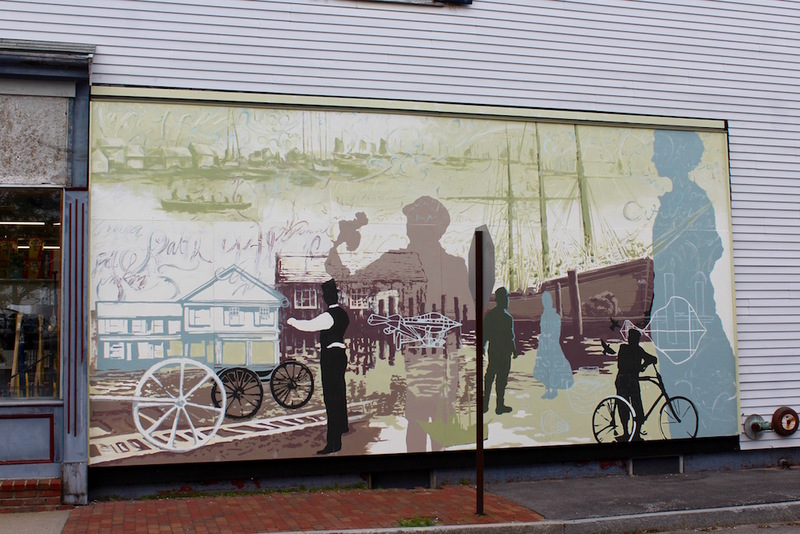 HYANNIS – When is a mural not just a mural? When it revitalizes a neighborhood. That is the goal of architect, educator and artist Mary-Ann Agresti of Yarmouthport, who along with artist Jackie Reeves of Sandwich, is painting a mural to be installed this week on the wall of Bradford’s Hardware on the corner of Pleasant Street and Main Street in Hyannis. Architect and artist Mary-Ann Agrestic shows her drawing of the Sea Captain’s Row mural to be installed on Pleasant Street in Hyannis, as artist Jackie Reeves paints in the background. The mural, nine panels stretching 24 feet long and 12 feet high with colors of blues, greens, yellow and sepia tones, has images hearkening back to the 1850s, depicting Hyannis’s illustrious past as a bustling seaport. Agresti used historic photos from the Hyannis Public Library to find images of Hyannis and people from the era to use in the mural. “It is a reminder that this neighborhood has a unique history we can draw on. There is already a really authentic place there and we wanted it to be recognized,” Agresti said. But the mural does not only reflect the past, Agresti said. She wants it to project the future. “We want it to be both nostalgic but not just, ‘wasn’t it nice back then.’ We wanted it to be something to build on. It’s cultural currency,” she said. The drawing of the mural. Overlaying the seaport images are old-fashioned handwriting similar to old letters that sea captain’s wives might have written to their husbands, or ship’s logs by Hyannis sea captains who sailed the seven seas. Some figures are oversized shadows, other elements hover over parts of the mural. One section will stick out with figures in three-dimensions. The mural will welcome visitors to “Sea Captain’s Row,” which is what Pleasant Street was in the past and what proponents hope it will be again in the future. Mary-Ann Agresti paints a section of the mural. Talladay said when she herself walked the street and realized the rundown condition of many of the properties and that many of them were for sale, she realized the importance of highlighting the historical importance of the area. Agresti said both the mural project as well as a historic walking tour map of the area that she produced, were inspired by a resident of the street, Dominic Alessandra, a photographer and retired educator who moved into a sea captain’s house on Pleasant Street in 2007. After moving into the 1852 Captain Allen Crowell home, Alessandra became intrigued with the street’s history and the Greek Revival sea captain’s homes along the block. He did extensive research at the Hyannis Public Library into the history of the houses on the street and he has become passionate about preserving the street’s history. Pleasant Street, according to Alessandra, is not just any street. “The street is a time capsule, historical and geographical. It is hidden but in full view, a unique architectural footprint,” he said. Of the several 19th century homes on the street, some are seemingly abandoned and derelict properties but their antique “bones” are still intact, with the Greek Revival rooflines and authentic trim of an earlier era. Dominic Alessandra, a resident of Pleasant Street, has made it his mission for the street’s rich history to be recognized. He has put up signage about “Sea Captain’s Row” in front of his home. For Alessandra, Pleasant Street, while only 800 feet long in the block between Main Street and South Street, encompasses no less than the history of Hyannis. The bottom of the street adjacent to the harbor was an original settlement of Iyannough, the Native American sachem who gave Hyannis its name, he said. Also on that end of the street beginning in 1666, a Quaker named Nicholas Davis was considered the first European settler of Hyannis, having been granted lands by the Native Americans who lived here. He raised oysters in Lewis Bay. On the other end of the street, near Bradford’s, was the home of Alexander Baxter, a daring sea captain who broke the British blockade during the War of 1812 who later became a banker who was considered the “father” of Hyannis. Eleven of the 14 properties on the street date possibly back to the 1740s and up to the 1890s, Alessandra said. The street also has a presidential connection but it is not the usual Hyannis connection to President John F. Kennedy. This connection goes back much further, to President Ullysses S. Grant, who is said to have spoken to a crowd on the corner of Pleasant Street and Main Street in 1874. Today, Alessandra said, “The street is in jeopardy.” He traces some of the street’s woes on the fact that 30 years ago, property owners, taking advantage of the street’s proximity to the Steamship Authority docks running ferries to Nantucket, began converting front yards into parking lots. Alessandra said, Maurice McEvoy, a local businessman who died in 2014, bought up many of the properties on the street to use as parking lots. Some of the historic houses were demolished; others were abandoned. 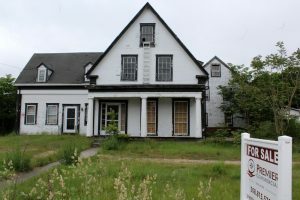 One of the historic sea captain’s homes on Pleasant Street–abandoned and for sale. “Houses were neglected,” Alessandra said. Now the five properties that McEvoy owned are controlled by a trust and have been listed for sale. That means the street is at a crossroads. There may be developers who want to tear down the historic houses, but Alessandra and others hope some of the buildings can be preserved. “We don’t know what tomorrow will bring,” he said. Alessandra, who has restored his property with great care, hopes that the other historic houses on the street will get the same treatment. Alessandra is excited about the Bradford’s mural—in fact it was his idea. “We’ve been working a long time to get the street recognized. We’re finally getting out there,” he said. Alessandra was the first one to show Pleasant Street to Agresti which led to her designing a map in 2014 depicting the historic importance of the area. 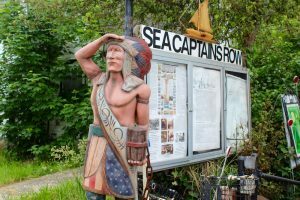 In Alessandra’s research on the street, he uncovered an early 20th century reference calling it, “Sea Captain’s Row.” He has promoted that designation for the street, installing it on signs outside his house. Tools of the trade–all donated for the mural project by Bradford’s. Agresti’s architectural firm, The Design Initiative Inc., is located not far from Pleasant Street but she admitted she had never ventured out to explore the street before Alessandro gave her a tour. Because Pleasant Street lies between the Hyannis Transportation Center, where buses and trains arrive from Boston, and the Steamship Authority ferry terminal with ferries to the islands, Agresti called the map project “the spaces between” as a way to draw people’s attention to places they may not notice while going from one destination to another. CARE for the Cape and Islands also funded Agresti’s Sea Captain’s Row map of Pleasant Street. Talladay said CARE likes projects to have “longevity” as opposed to “one-time fixes.” So, she said, she liked the idea that the map encouraging exploration of the area led to the idea for the mural, continuing to revitalize the street. Alessandra’s enthusiasm did not just inspire Agresti. Community leaders spurred on by him have banded together to form a new association, the Greater Hyannis Historical Society, which was incorporated last fall to highlight and educate people on the forgotten history of the area. Barnstable Town Councilor Paul Hebert has been a strong proponent of the historical society. Local business leaders agree that the mural could be the start of something positive for Pleasant Street and the entire east Main Street area of Hyannis. “We love the additional fun and historic flavor it adds to the street. We have some ideas to do some partnering for more in the future,” said Elizabeth Wurfbain, Executive Director of the Hyannis Main Street Business Improvement District. For Carrie Robinson Abelli, who is the fourth generation in her family to run Bradford’s Hardware store, the mural is an ideal way to show the unique history of the area. Bradford’s Hardware has been in the same family for four generations. Abelli is not sure the exact year her great grandfather Harry Bearse began working at Bradford’s but she knows it was prior to the 1892 fire that destroyed the store, which was then rebuilt in its current building. Not much has changed about the Bradford’s building since the fire. “We’ve always wanted to keep the store looking like it did 100 years ago,” she said. Harry Bearse began working at the store when he was just a boy. Years later, the store’s namesake, Myron Bradford sold the store to Bearse. Before: The wall of Bradford’s Hardware on Pleasant Street where the mural will be installed. Thurlow Bearse’s daughter Martha and her husband Rick Robinson, who are Abelli’s parents, ran the business and now Abelli, who is general manager, is continuing the tradition. “Seems like my whole life,” said Abelli, who is a 1991 graduate of Barnstable High School. Her son Sam Perkins, 15, now works at the store. “He’s the fifth generation,” Abelli said. After: The new mural installed on Pleasant Street. Abelli said she hopes the mural begins the renewal of the area. When she first began working at the store as a girl, she remembers the street differently. “Houses were still kept up and lawns were mowed. I hope this starts to clean up the rest of the street. It’s such a beautiful street,” she said. She said she looks forward to the installation of the mural. “They’re doing a great job. I like how it captures so much of the history with the shadow figures. It gives it that old-time feeling, takes you back in your mind,” she said. Agresti said the mural project has been supported extensively by the community. Wayne Kurker of Hyannis Marina donated space in a second floor boat loft for the artists to paint the mural. All materials were donated, with Bradford’s donating the paint and painting supplies. Shepley donated the mural panels and Home Depot donated the two by fours. While those three businesses are technically competitors, Agresti said they all put that aside. “This is about community. Everyone came together. It was about the project,” she said. Jackie Reeves and Mary-Ann Agresti are the artists behind the new mural on Pleasant Street in Hyannis. 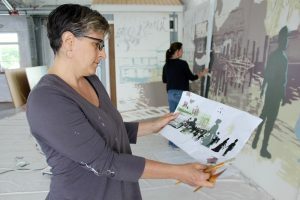 Given the size of the mural, Agresti said it would be about a $40,000 project, but with all the generous private donations and in-kind donations, it is costing only about $7,000, with many hours and weeks of “labor of love” work by her and Reeves. Along with the support from CARE of the Cape and Islands, there is still some fundraising ongoing for the project. Agresti said that is what makes the project more than it appears. “It may be just a mural to some people but it’s another conversation. The focus is integrating with the community. That’s the bigger picture,” she said.